Lindsey Robinson Sanchez, from Bessemer, Ala., has written for the "Troy Messenger," "The Alabama Baptist" and "The Gainesville Times," where her work was featured on the AP wire. She has a Bachelor of Science in journalism from the University of Florida. She writes style, beauty, fitness, travel and culture. The same baking soda that freshens the fridge, bloats the bread and wedges some whitening power into toothpaste can also be used as an oil-zapping face mask. This all-purpose powder, which many people already have around the house, is a natural exfoliate that helps calm acne and over-productive oil glands. While it can make an effective skin scrub all on its own, you can pair baking soda with several other household products to pamper your skin and leave it smooth, fresh and clean. Mix 1 tablespoon cool water in a small bowl with 1 1/2 tablespoons baking soda to form a thick liquid. Smooth the mixture over your clean face and let sit for five to 10 minutes -- shorter for drier skin, longer for oiler skin. Rinse with warm water, pat your face dry with a soft towel, and follow with a gentle, oil-free moisturizer. Blend 1 tablespoon baking soda with 1 teaspoon no-pulp orange juice in a small bowl. Rub the mixture onto clean skin, using gentle circular motions, and leave for up to 20 minutes. Rinse clean, pat your face dry and moisturize. The vitamin C in the orange juice will leave skin brighter, while the citric acid will help to exfoliate and make pores less visible. Pour 1 tablespoon hydrogen peroxide into a small bowl and mix in 1 tablespoon of baking soda (enjoy the science-fair foaming action). Apply to clean skin and wait five minutes. Rinse clean, pat your skin dry, and follow with moisturizer. Repeat no more than once a week on oily skin. Place 2 tablespoons baking soda into a small bowl and mix with 1 teaspoon honey and the juice from half a lemon. Smooth the mixture onto your face in a thin layer and let it sit for 15 minutes. Lemons, like orange juice, brighten skin. Honey is a naturally antibacterial moisturizer and helps soothe dry, combination or acne-prone skin. Pour 1/3 cup baking soda into a bowl and mix with the juice from half a lemon and 2 tablespoons tea tree oil. Apply generously to your face, wait for 10 minutes, then rinse. Pat your skin dry and then moisturize. Tea tree oil will provide natural acne relief. This mask is best for oiler skin. If you have leftover mask, apply it to your neck, hands, feet, or anywhere you have rough, oily or acne-prone skin. 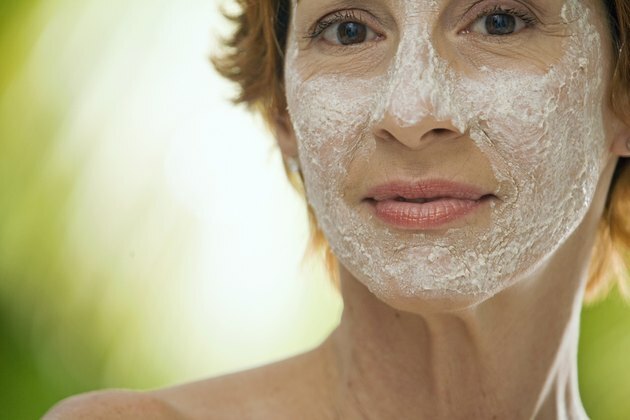 Do not apply these masks over broken skin, as baking soda, citrus fruit, hydrogen peroxide and tea tree oil can all be irritating on damaged areas. Test new masks on a patch of skin, such as the inside of your wrist or your jawline, before using over your entire face.